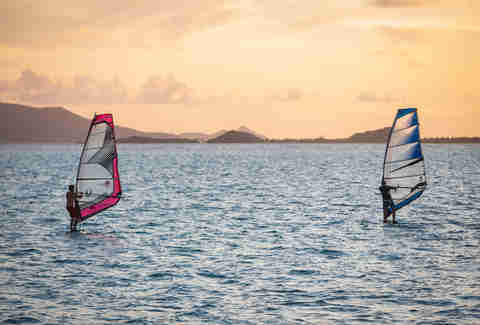 The Caribbean is so much more than tanning and sipping sugary drinks at an all-inclusive. Sure, if that's your ideal vacation, have at it. But if you're going to pay as much to fly to an island a couple hours from Miami as you would to fly to Europe, allow me to recommend something a bit more ambitious. Despite the fact that most of these islands are tiny countries or territories, they have national parks as impressive and well-developed as what you're accustomed to in the States. We conferred with Patrick Bennett, one of the co-founders of Uncommon Caribbean, who's traveled to nearly every island in the region. We found the best -- and sometimes lesser-known -- national parks in the Caribbean. Because of the fierce winds that blow through Aruba, the entire island is a tropical desertscape. Nowhere is this more beautifully exemplified than at Arikok National Park, which occupies some 20% of the island. A sweeping desert dotted with cacti, it's also home to a set of natural pools along the coast, where visitors can dive from the top of limestone rocks into the warm water. Elsewhere it boasts limestone caves, remote sandy beaches, and ruins of the Bushiribana Gold Mill, a crumbling remnant of a 200-year-old gold rush. Simply put, you will not find another beach in the world anything like the Baths. 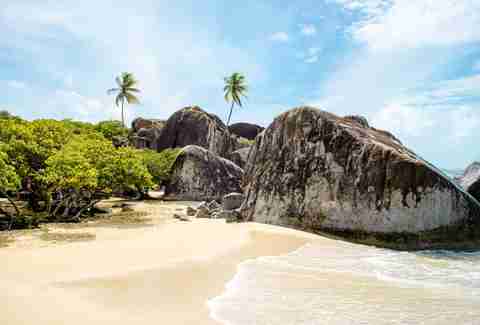 The short hike down to the sand ends with mysterious giant boulders sitting right in the sea, with strangely spaced single palm trees along the shoreline. These give the place the look of a remote island where pirates buried treasure, and is the best place in the region to live out your pirate beach fantasy. But the beach is only half of the draw here: A watery trail through the boulders and associated caves they create is like a trip inside the earth, where sunlight beams down through rocks and illuminates the bright-green water as you wade through. 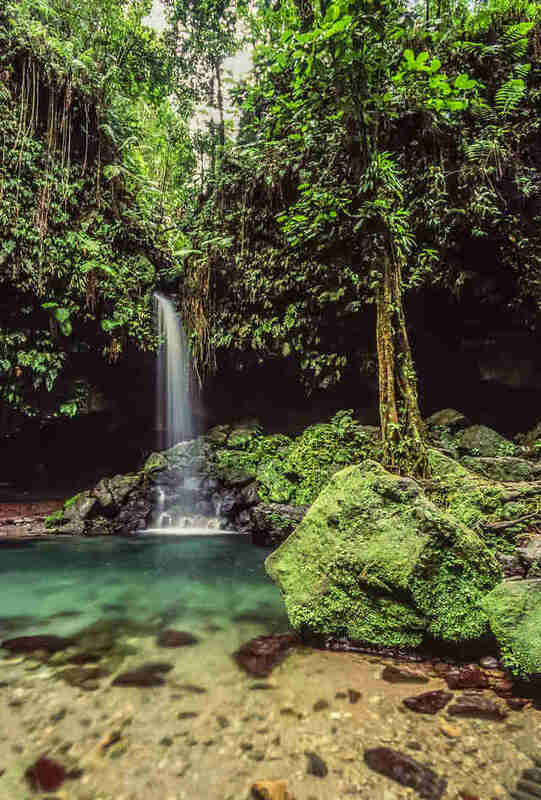 Who will love it: Hikers who dream of trekking through thick jungles to tropical waterfalls; hipsters who find Hawaii "played out"
Dominica (pronounced doe-min-EE-kuh) calls itself "the nature island." Which sounds like sort of a dull moniker until you've made a trip to its signature national park at Morne Trois Pitons. Hiking here is a jungle expedition without the machete, where clear trails lead you through thick tropical foliage as birds and insects call out along the way. The reward at the end: the majestic Victoria and Trafalgar Waterfalls, which you’d swear were landscaped had you not just tromped through the entire park. It’s also home to the some of the highest mountains in the Caribbean, as well as Boiling Lake where, as the name might imply, temperatures reach boiling in the center. So maybe skip the "refreshing" swim once you get there. 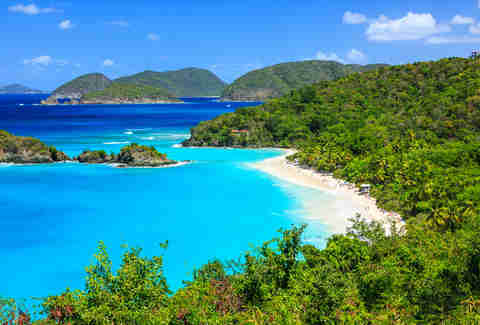 The most recognizable feature of this park, which takes up half of St. John, is Trunk Bay. 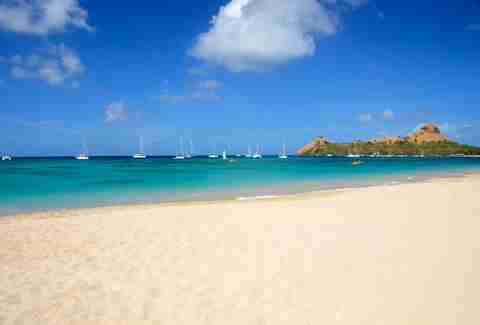 Despite the occasional tourist influx, its white sand beach is still among the best in the Caribbean. But what few know about this park is the deep history that lies within. The park contains more than 100 historic sites, including old sugar plantations, colonial schools, windmills, and rum factories. The history here dates back far before Columbus: Archeological sites from as far back as 840 BC give visitors a chance to learn about the Taíno people, the Virgin Islands' first inhabitants. Cultural artifacts from the Taíno are at nearly every beach, none more striking than the rock carvings at Reef Bay. Besides the fantastic surfing and fascinating culture, this monstrous mountain fortress is another reason Haiti is one of the most underrated destinations in the Caribbean. 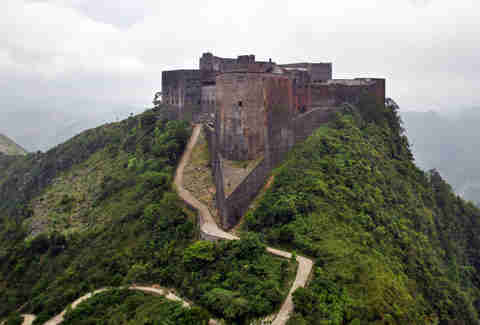 Citadelle Laferriere is the largest fortress in North America, with 130ft walls standing straight atop 3,000ft L'Eveque mountain. It was first designed to protect newly independent Haiti against invasions from its former occupier, France, and on a clear day from the top one can see all the way to Cuba. It took nearly 20,000 people and 20 years to build, but the result is one of the most impressive structures in the Caribbean. And if you find yourself in the village of Milot, it's only a six-mile trip. Who will love it: Divers. And not just people with PADI cards who do half-day trips on vacation. Rather: people who plan to spend entire vacations underwater. As you might have guessed from the name, there's not much actual land in this 6,672-acre park. 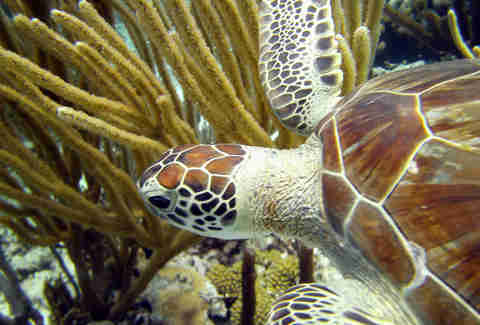 It encompasses all the water around Bonaire down to 200 meters, as well as the island of Klein Bonaire and the waters around it. A trip through the mangroves of Lac Bay -- the other land encompassed by the park -- is the simpler, shadier way to enjoy the waters of Bonaire, but truly no park in the Caribbean comes close for divers. BNMP has a strict no-anchoring policy, which means the 57 species of coral living below the surface are some of the most pristine in the world. With 86 dive sites and 350 recorded species of fish, the variety and scenery here are unparalleled in the region. Who will love it: Anyone who wants a beautiful beach in the Bahamas without having to deal with a resort. Or people. 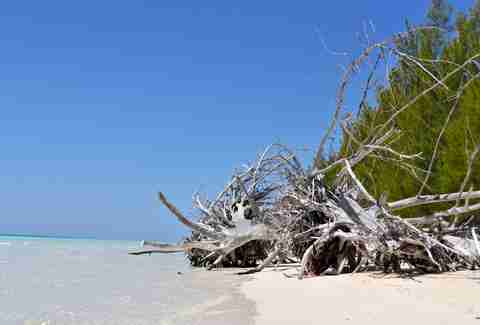 If you want a peek into what the uncharted wilderness of the Lucayan Archipelago was like before it was filled with mega-resorts, this 40-acre park on the south shore of Grand Bahama is the place. Kayaking through the mangroves is a trip into the last unspoiled swampy wetlands on this part of the island, and feels like a remote backwater journey into uncharted tropical flora. But this park is special because it's equally as impressive under the water as above it. Below the park sit a series of diveable underwater caves, one of the the longest systems of charted caves in the world. 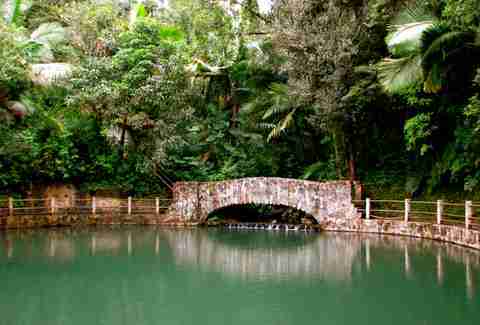 In the entire US National Forest system, El Yunque is the only tropical rainforest. Because the El Yunque mountains sit in the far northeast of Puerto Rico, they are the first to get rain brought by the trade winds, and as such the forest at the highest elevation is a cool, tropical oasis. 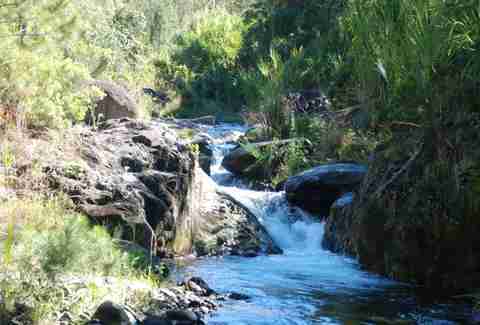 The recreational opportunities here are amazingly diverse, whether you want to climb above the clouds to the tower of Mount Britton, or the dwarf forest at the height of the mountains, where vegetation is sparse. The park also has caves full of carvings from the indigenous Taíno people. And the bioluminescent bay at Fajardo is a unique place where you can watch virtual starbursts of plankton as you move your hands through the water. 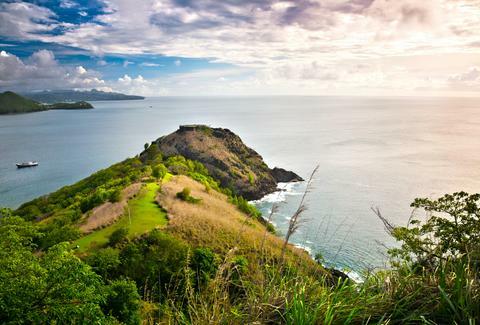 This dual-peaked island off the northwest coast of St. Lucia was among the most important military locations for British and French conflicts throughout colonial times. In retaliation for their support of American colonists during the Revolution, the British attacked and took St. Lucia from the French in 1778, establishing a naval base here to monitor French movement from Martinique. The remnants of this base and other military structures are still on the island, which is now connected to mainland St. Lucia via a causeway. Beyond colonial history, a hike to the top of either peak on this island is a fantastic way to appreciate St. Lucia's jagged wilderness, and the view from either is worth the short-but-strenuous climb. The name has a biblical sound, like somehow the depths of hell came to the surface and made a fort on a mountain. And strangely, that's kinda what happened on this hill above the Caribbean Sea. About 6,000 years ago a volcanic eruption formed an 800ft mass of volcanic rock, creating a new and imposing formation along the coastline. Ultimately, the British found this mass useful for building a giant protective fort, and constructed it out of the black rocks that made up the hillside over 100 years. "Brimstone Hill isn't just on top of Brimstone Hill," says Bennett. "It IS Brimstone Hill." 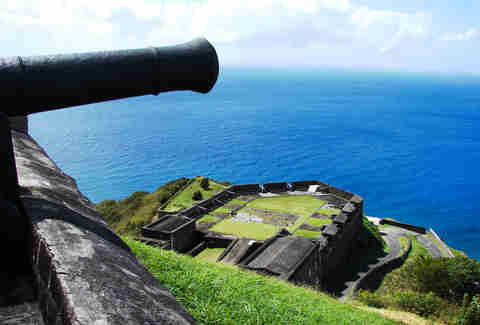 The fort is a UNESCO World Heritage Site, and is commonly referred to as "the Gibraltar of the West Indies." 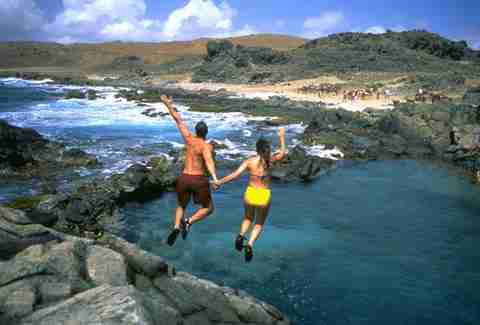 The DR has become a top tourism destination thanks mostly to its pristine beaches and the luxury resorts that line them. But heading inland is the way to truly experience the country's natural wonders, most prominently at this park -- home to Pico Duarte, a 10,164ft mountain, the tallest in the Caribbean and, east of the Rockies, the highest in North America. Climbing it is a 23-mile, three-day excursion deep into the Dominican wilderness, equal parts remote escape and physical challenge. But the reward at the end is a view above the clouds, literally the top of the Caribbean where you can take a selfie with a bust of Pico Duarte and gaze out over the entire country. This park known as the "Jewel in the Crown" of the Southern Grenadines is about as close to being marooned on a Caribbean island as you can get without having to befriend a volleyball. The 20-square-mile bay is dotted with five palm- and mangrove-filled cays, four of which sit around an epic, mostly undisturbed coral reef. "It’s almost as though a divine architect took a poll of our deepest tropical desires only to render them in a masterpiece of turquoise, ultra-marine, pink, and emerald," Bennett says. This park truly is a place where one can enjoy the natural wonders of the Caribbean without feeling overwhelmed by other people. Matt Meltzer is a staff writer with Thrillist who still enjoys a fruity drink at an all-inclusive. Follow him on Instagram @meltrez1.